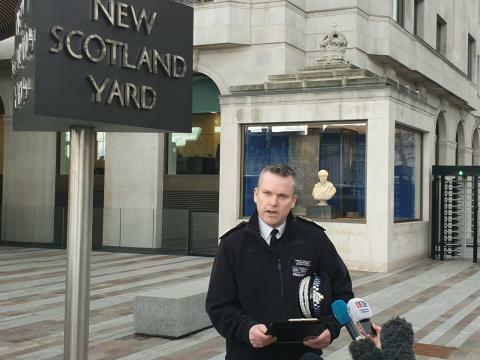 "We have had a tragic ten days in London where we have seen a number of high profile, violent incidents and our thoughts are very much with the families and friends and indeed the wider communities affected by these tragic events. One incident, one injury, one death is one too many. "Tackling violent crime remains the Met's top priority and we have been working day and night to make progress. In advance of the weekend just passed, we had arranged for more officers from our Violent Crime Taskforce to be on duty and we have extended their shifts to raise our visibility across London. These officers are operating across London in both uniform and plain clothes. Officers from the homicide teams are working around the clock to bring justice to families and protect communities. "This increased police presence has made a difference with officers conducting more than 2,500 stop and searches in the last three days alone. To give some idea of the scale of our activity around tackling knife crime, in the last 12 months we have seized thousands of weapons by utilising stop and search. "However, we are not complacent and I would appeal to the public to contact police if they are aware of anyone carrying a knife. "If you are not comfortable about speaking directly to police, please do contact Crimestoppers where you can provide information anonymously. By doing this, you could save a life. "Whilst enforcement of the law is an important part of our activity in London, we are undertaking an enormous amount of work within schools and across the communities to try and prevent young people from getting involved in violence. "We continue to work with partners in the Home Office, the Mayor's Office and other organisations such as The Prince's Trust to ensure we are taking a wide-ranging approach to tackling knife crime. "We know that there is still a significant amount of work to do in order to rid the Capital of violence and we absolutely cannot solve this problem alone. The police, our partners and the public must continue to work together to prevent young lives being lost."